Mamma Mia! 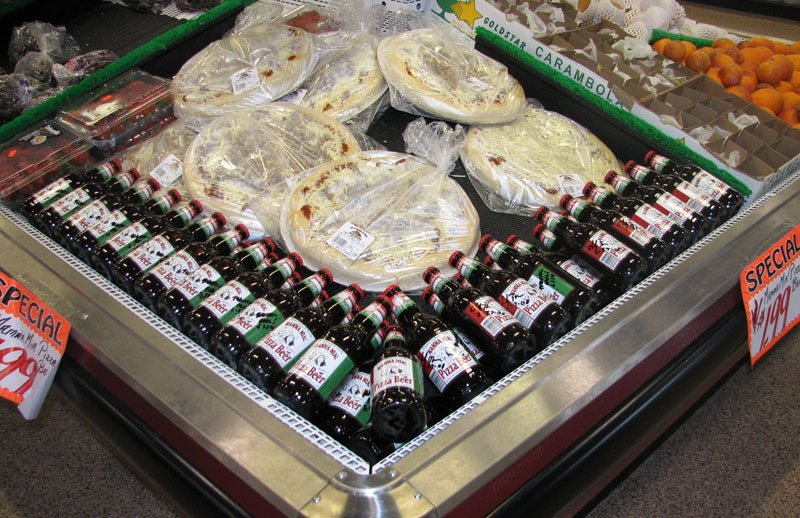 Pizza Beer is brewed with basil, oregano, garlic and tomatoes. We’ve all seen the T-shirt, Beer Is Food. A growing number of brewers have taken that sentiment to near-literal levels by concocting recipes strongly influenced by culinary creations, be they breakfast, lunch, dinner, dessert or between-meal snacks. Of course, any time a brewery attempts a beer designed to evoke a certain edible, it walks a fine line between flavorful innovation and gimmick. Tom Seefurth is certainly no stranger to having his creations being labeled the latter ever since he decided to eliminate the middleman in the classic, pre-foodie-movement pairing of beer and pizza. About eight years ago he and his wife, Athena, used whatever pizza-friendly herbs they could harvest from their garden—particularly fresh basil and oregano—along with garlic and, of course, tomatoes. “Some goes in the mash and some goes into the boil,” Tom Seefurth explains. The result was Mamma Mia! Pizza Beer. That brewery, from 2008 until recently, was Sprecher, but Seefurth is in the process of transitioning to another contract brewer. Sprecher notified Seefurth last December that it was hitting capacity with its own products and he would have to produce Mamma Mia! elsewhere. Back when Seefurth first produced Mamma Mia! some of the initial criticism came from his homebrewing peers in the Chicago Beer Society, of which he was an active member. “It was kind of interesting because a lot of people who were in the beer society saw it as a gimmick,” he says. He also concedes that the grades on various beer rating sites weren’t exactly stellar once drinkers started trying it. One of the keys to minimizing the number of “awfuls” drinkers hurl at culinary-inspired beer is to remember that it is, first and foremost, a beer, and it should still taste as such. That was the guiding principle behind Carton Brewing Co.’s summer release Panzanella, another beer designed to echo tomato-forward Italian food. In this case its source of inspiration was the salad of the same name, popular in Tuscany, where Augie Carton and his wife spent their honeymoon. Like most classic Italian fare, the Tuscan summer salad is the result of the symphonic arrangement of a few simple ingredients: day-old bread, tomatoes, cucumbers, onions, salt and (sometimes) garlic. To emulate that, the Atlantic Highlands, NJ, brewer started off with a bready 3.8% base and then dressed it up a bit. “We had a really crackery malt bill, then added some Summit hops, which already taste like onions and garlic,” Carton says. Next up: peeled cucumbers. “We didn’t want to taste cucumber skins,” he explains. The brewery used dehydrated tomatoes, mainly to avoid adding more water, and rounded out the recipe with salt. “It needs salt to make sense,” Carton says. The project succeeded in its mission, he says, because it was greater than the sum of its parts. It simply reminded drinkers of a salad while remaining a refreshing summer beer. Some even swore that they were tasting celery even though there wasn’t any in the recipe. That was the result of the interplay between the cucumbers and hops, which brought a bitter dimension to the former reminiscent of celery’s slight bitterness. They were going for what she describes as a “chocolate-covered raisin/chocolate- covered peanut confection” kind of flavor (think Raisinets and Goobers). To achieve that, the team used, in addition to chocolate and caramel malts, Special B, a malt known to exhibit raisin/dried fruit characteristics. 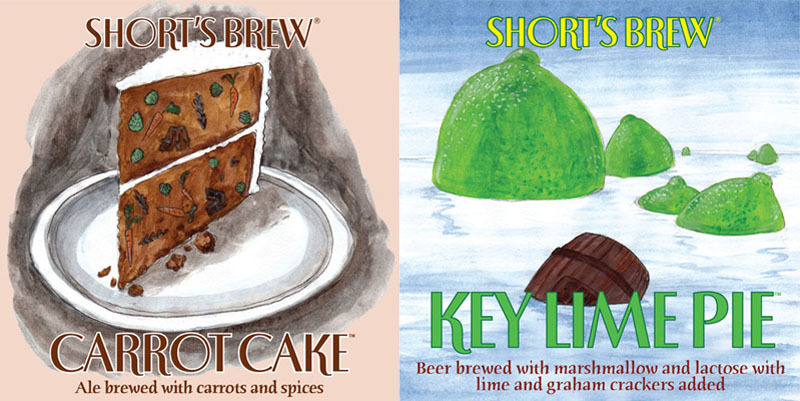 Fruity confections also have been the domain of Short’s Brewing Co., particularly its Key Lime Pie release, which incorporates fresh key limes complemented with a small amount of fruity hops. The sweetness from marshmallows and milk sugar is amped up with large amounts of specialty malts. It even has some graham cracker crumbs combined with toasty malts to simulate the crust flavor. Short’s gets even more experimental with its Carrot Cake offering, which, says Short’s head brewer Tony Hansen, includes more ingredients than any other beer in the Bell-aire, MI, brewery’s portfolio: carrot, walnuts, pecans, orange zest, marshmallow, maple syrup, vanilla, nutmeg, ginger and allspice. It’s no surprise that Hansen is a former cook. “Keeping the flavors from becoming overly sweet can be tricky when brewing a dessert-inspired beer,” says Hansen. “Finding a balance between the sweet dessert flavor and the drinkable beer can be achieved by the correct usage of traditional brewing ingredients.” A healthy bittering hop addition, he notes, or a yeast strain that finishes dry can help balance the sweetness, as can boosting the ABV. And nailing it is never an easy thing to do for any brewer. A food is a popular and fairly obvious inspiration for beer; there are exponentially more attempts than there are successes out on the market. This story appears in the January 2015 issue of All About Beer Magazine. Click here for a free trial of our next issue.